Received February 25, 2018; Revised March 30, 2018; Accepted April 2, 2018.; Published online April 18, 2018. Synapses and neural circuits form with exquisite specificity during brain development to allow the precise and appropriate flow of neural information. Although this property of synapses and neural circuits has been extensively investigated for more than a century, molecular mechanisms underlying this property are only recently being unveiled. Recent studies highlight several classes of cell-surface proteins as organizing hubs in building structural and functional architectures of specific synapses and neural circuits. In the present mini-review, we discuss recent findings on various synapse organizers that confer the distinct properties of specific synapse types and neural circuit architectures in mammalian brains, with a particular focus on the hippocampus and cerebellum. The wiring of the brain occurs during development through a series of precisely orchestrated and complex developmental processes regulated by various mechanisms encompassing astronomical numbers of different neuronal cell types (Shen and Scheiffele, 2010). One of the hallmarks of neuronal cells is that an individual neuron forms a ‘specific’ network of synaptic connections, and that this circuit specificity is crucial for most, but not all, functions of the central nervous system (CNS) (Fig. 1). In this manner, each neuron is able to receive various input information from a variety of other neuronal cells, and send processed information to other neuronal cells to rapidly and precisely manage various cognitive tasks. How patterning of specific synaptic connections manifests is complicated, owing to the distinct and diverse structural and functional properties of these connections, which are collectively determined by specific synapse-type properties, such as action potential firing, synaptic plasticity, presynaptic neurotransmitter release probability, and postsynaptic receptor repertoires (Südhof, 2017a). Although cellular mechanisms that allow specific neuronal connections in early stages of CNS development have been well established, partly thanks to extensive studies on axon guidance pathways, molecular mechanisms underlying events in late stages of CNS development are less clear. For example, how does one neuron accomplish connections within the specific subcellular compartment of other partner neurons, and how are different types of neurons structurally and functionally linked in the final step of neural circuit assembly. Recent studies have revealed that various cell-surface proteins are instrumental in defining synaptic and circuit specificity, with discrete neuronal cell types exhibiting distinct expression patterns (Foldy et al., 2016; Paul et al., 2017; Shekhar et al., 2016) (Fig. 1). For instance, neurexins and neuroligins are prototypical pairs of synaptic cell-surface proteins that determine key synaptic parameters in distinct neural circuits (Anderson et al., 2015; Aoto et al., 2013; 2015; Foldy et al., 2013; Zhang et al., 2015). In addition, leucine-rich repeat (LRR)-containing cell-surface proteins have emerged as key building blocks for synaptic and circuit specificity by virtue of their specific connectivity with other cell-surface proteins (de Wit and Ghosh, 2016; Ko, 2012; Um and Ko, 2013; 2017). However, given the vast number of synapse and circuit types in the mammalian brain, how the variety of cell-surface proteins orchestrates discrete aspects of synapse and circuit development in a context-dependent manner remains unknown. Moreover, it is still unclear how glial cells contribute to subcellular specificity across various brain areas (Allen and Eroglu, 2017; Williams et al., 2010). In the present minireview, we discuss the roles of different synaptic cell-surface proteins in regulating specific synaptic connectivity and properties across various brain areas, focusing on those in the hippocampus and cerebellum. Because several excellent recent reviews have addressed the role of LRR proteins in synaptic and circuit specificity (de Wit and Ghosh, 2014; 2016), we mainly discuss the roles of other classes of synaptic adhesion molecules in specifying the properties of distinct synapse types. The entorhinal cortex (EC) constitutes a fraction of the medial temporal lobe, and acts as the main interface between the hippocampus and neocortex. The EC is divided into two subdivisions lateral and medial that exhibit distinct anatomical features and input-output connectivity (Witter et al., 2000a; 2000b). For example, the lateral EC is strongly connected to the perirhinal cortex, olfactory and insular cortex, and the amygdala. In contrast, the medial EC preferentially connects with the postrhinal cortex, the subiculum, and occipital and retrosplenial cortices (Witter et al., 2000a). Two EC subdivisions target the same neurons in the dentate gyrus and CA3, while they reciprocally connect to different groups of neurons in the CA1 and subiculum. Similar to the case in other cortices, neurons in the EC are grouped into six different layers, each of which features a dominant cell type. In particular, layer II neurons mainly project to the dentate gyrus and hippocampal CA3 subfield, and axons of layer III neurons project largely to the hippocampal CA1 subfield and subiculum (Witter et al., 2000a). Notably, EC-hippocampal neural circuits play a critical role in spatial and temporal dimensions of episodic memory by combining cortical exteroceptive information with interoceptive representations to translate higher-order complex cognitive functions (Eichenbaum et al., 2007; Kitamura et al., 2015b). Medial EC neurons mediate spatial navigation through grid cells, head-direction cells, and border cells (Sasaki et al., 2015). In contrast, lateral EC neurons preferentially mediate olfactory, visual, or tactile responses (Eichenbaum et al., 2007). Recent studies have directly mapped the medial EC-hippocampal CA1 and lateral EC-hippocampal CA1 connectivities that are distinctively required for olfactory associative learning (Li et al., 2017), episodic memory tasks involving a temporal delay and/or a behavioral switch (Suh et al., 2011), and temporal gating of intrahippocampal information flow (Basu et al., 2016). In addition, island cells in the medial EC provide a direct feedforward inhibitory circuit to distal apical dendrites of the stratum lacunosum-moleculare (SLM) of hippocampal CA1 pyramidal neurons (Kitamura et al., 2015a; 2015b). To date, only a few molecular mechanisms that mediate development of selective EC-hippocampal neural circuits have been identified. Latrophilin-2, a member of the α-latrotoxin-binding adhesion G protein-coupled receptor (GPCR) family, was recently found to be expressed in excitatory synapses in distal dendrites of the SLM (Anderson et al., 2017) (Fig. 2A). Deletion of latrophilin-2 from the mouse hippocampal CA1 selectively induced a loss of synaptic inputs from layer III EC neurons, and acted in a homeostatic manner to trigger an increase in synaptic connections formed by Schaffer collaterals emanating from hippocampal CA3 pyramidal neurons (Anderson et al., 2017). Moreover, loss of latrophilin-2 in the mouse SLM was found to impair learning and memory tasks involving sequential temporal switching, but not spatial learning (Anderson et al., 2017). These results suggest that a specific cell-surface protein (latrophilin-2) determines the property of a specific neural circuit (lateral EC to hippocampal SLM) to enable cognitive flexibility. Given the multivalent structural domains of latrophilin-2, it will be interesting to understand how the trans-synaptic ligands of latrophilin-2 (e.g., neurexins, teneurins, and fibronectin leucine-rich transmembrane proteins [FLRTs]) are involved in recognizing layer III EC inputs onto the hippocampal SLM (Boucard et al., 2012; Lu et al., 2015; O’Sullivan et al., 2012; Silva et al., 2011) (Fig. 2A). An additional provocative question is whether signaling by the adhesion GPCR involving latrophil-in-2 and its ligands orchestrates the engagement of G protein-mediated signaling. Furthermore, it is possible that other latrophilins (latrophilin-1 or -3) may also act in the same neural circuit, or specifically function in other hippocampal neural circuits. The Schaffer collateral pathway involves axon projections emanating from hippocampal CA3 pyramidal neurons that target proximal dendrites of hippocampal CA1 dendrites. This neural circuit is a crucial part of memory formation and has been a main locus for investigation of mechanisms involved in hippocampal synaptic plasticity. Numerous synaptic molecules have been shown to be critical for hippocampal long-term synaptic plasticity, which is dependent on postsynaptic N-methyl-D-aspartate (NMDA)-type glutamate receptors (Huganir and Nicoll, 2013). However, how this neural circuit is molecularly specified has been largely unknown. Among the few known molecular components is netrin-G ligand-2 (NGL-2), an LRR-containing synaptic membrane protein that is strongly expressed in hippocampal CA1 pyramidal neurons. Intriguingly, loss of NGL-2 selectively decreases excitatory synapse development in the stratum radiatum (SR) layer, but not in the SLM, of hippocampal CA1 pyramidal neurons (DeNardo et al., 2012). Moreover, NGL-2 contributes to the formation of this specific neural circuit through interactions with its presynaptic ligand netrin-G2, which is specifically expressed by CA3 Schaffer collateral axons, but not by EC axons (DeNardo et al., 2012; Nishimura-Akiyoshi et al., 2007) (Fig. 2A). In contrast, it is possible that netrin-G ligand-1 (NGL-1) and its presynaptic ligand netrin-G1 specifically regulate the properties of neural circuits that link the EC to the SLM of hippocampal CA1 pyramidal neurons. Although this has not been experimentally demonstrated, it is plausible considering that netrin-G1 is specifically expressed in EC axons, but not in CA3 Schaffer collateral axons (Nishimura-Akiyoshi et al., 2007). CA3 Schaffer collateral axons are also connected to the stratum oriens (SO), which has functionally distinct properties (Megias et al., 2001). A recent study reported the involvement of heterophilic interactions of type II cadherins in the CA3-CA1 SO neural circuitry (Basu et al., 2017). Cadherin-9 is strongly expressed in CA3 pyramidal neurons (Williams et al., 2011), and cadherin-6 and cadherin-10 are specifically expressed in CA1 pyramidal neurons (Basu et al., 2017). Strikingly, cadherin-9 is specifically required for excitatory synapse development and high-magnitude synaptic potentiation (Basu et al., 2017). Moreover, cadherin-6 and cadherin-10 function as postsynaptic binding partners for cadherin-9 to mediate the high-magnitude, but not normal-magnitude, long-term potentiation that is uniquely observed in the CA1 SO layer (Basu et al., 2017) (Fig. 2A). Given the diversity of cadherins that are widely expressed in the brain, an analysis of the contributions of other cadherins to the building of input-specific excitatory and inhibitory synapses in different neural circuit contexts is warranted. CA3 pyramidal neurons receive various types of inputs from dentate gyrus granule neurons, other CA3 neurons, and EC neurons with distinct synaptic properties. In particular, dentate gyrus-CA3 mossy fiber synapses connect glutamatergic dentate granule neurons to both glutamatergic CA3 pyramidal neurons and GABAergic interneurons. The former synapses are morphologically special and unique, with multiple active zones and multi-headed spines called thorny excrescences (TEs), whereas the latter synapses are formed between filopodia projecting from the presynaptic bouton and nearby GABAergic interneurons. Moreover, filopodial mossy fiber synapses mediate feed-forward inhibition of CA3 pyramidal neurons to fine tune the main dentate gyrus-CA3 neural circuits in performing cognitive tasks (Ruediger et al., 2011; Torborg et al., 2010). Although both main dentate gyrus-CA3 and filopodial mossy fiber synapses are anatomically linked, the identity of the target-specific cues that construct these different synapse types has been largely unknown. Recent studies demonstrated that Kirrel3 (also called Neph2), an evolutionarily conserved homophilic immunoglobulin superfamily member, is specifically required for filopodial mossy fiber synapses (Martin et al., 2015; 2017). Kirrel3 is highly expressed in dentate gyrus granule neurons and a subset of GABAergic interneurons (Martin et al., 2015). Functionally, Kirrel3 is required to maintain feed-forward inhibition and constrain CA3 neuron excitability in juvenile mice (Martin et al., 2015) (Fig. 2A). In support of this observation, loss of Kirrel3 causes a significant increase in excitatory synaptic transmission in dentate gyrus granule neurons during a specific developmental time window (Roh et al., 2017). Future studies should address how molecular complexes involving Kirrel3, its extracellular ligands, and intramolecular components [e.g. PDZ-containing excitatory postsynaptic scaffolds; see (Choi et al., 2015)] act in concert to shape filopodial mossy fiber synapses in the hippocampal CA3. In addition, it would be interesting to determine whether Kirrel3 is also involved in specific filopodial mossy fiber synapses of adult-born dentate gyrus granule neurons. CA1 pyramidal neurons receive inputs from neurons of various brain areas, including the EC, thalamus, and CA3 (Spruston, 2008). Intriguingly, distinct populations of GA-BAergic interneurons form specific synapses with specific subcellular compartments of CA1 pyramidal neurons to achieve targeted inhibition in the hippocampal network (McBain and Fisahn, 2001; Spruston, 2008). Two types of feedback inhibition that limit sustained CA1 pyramidal neuron firing have been identified: onset-transient inhibition mediated by parvalbumin (PV)-positive interneurons (Basket cells) and late-persistent inhibition mediated by neocortical Martinotti cells and somatostatin (SOM)-positive oriens-lacunosum moleculare (OLM) interneurons (Spruston, 2008). These two types of neural circuits exhibit distinct short-term plasticity properties. PV-positive interneurons receive depressing input with a high release probability through targeting of the perisomatic region of CA1 pyramidal neurons and other interneurons, whereas OLM interneurons receive facilitating input with a low release probability through targeting of apical dendrites of CA1 pyramidal neurons. Recent studies have shown that Elfn1 (extracellular leucine-rich repeat fibronectin containing 1) is selectively expressed in postsynaptic sites of SOM-positive interneurons in the hippocampal CA1 SO and regulates presynaptic release probability to direct the formation of highly facilitating pyramidal OLM synapses (Sylwestrak and Ghosh, 2012; Tomioka et al., 2014) (Fig. 2A). Importantly, loss of Elfn1 in mice induces alteration of metabotropic glutamate receptor 7 (mGluR7) expression, selectively in the SLM layer of the CA1 and the hilus of the dentate gyrus (Tomioka et al., 2014). In support of these electrophysiological and anatomical observations, seizure susceptibility is increased and impulsivity is heightened in Elfn1-knockout mice (Dolan and Mitchell, 2013; Tomioka et al., 2014). Neurexins and neuroligins function as context-dependent specifiers of synapse properties by combining local concentrations of different neurexin and neuroligin isoforms in specific neural circuits (Chen et al., 2017; Futai et al., 2013; Kim et al., 2017; Südhof, 2017b). Neuroligin-1 and neuroligin-2 act as key synapse organizers for excitatory and inhibitory synapse development, respectively, through corresponding interactions with unique sets of extracellular and intracellular mechanisms [reviewed in (Bemben et al., 2015; Katzman and Alberini, 2017)]. Neurexins are expressed in both excitatory and GABAergic interneurons (particularly, fast-spiking PV-positive interneurons) in the mouse hippocampus (Nguyen et al., 2016). Intriguingly, the presence of cell type-specific alternative splicing factors results in the expression of different neurexin isoforms in the mouse hippocampus: neurexin variants without an insert in splice site #4 are mainly expressed in excitatory neurons, whereas neurexin variants with an insert at this splice site #4 are primarily expressed in PV-positive interneurons (Nguyen et al., 2016). These results suggest the possibility that synaptic specificity conferred by neurexin-neuroligin synaptic adhesion pathways could be partially determined by expression levels of neurexin splice variants and the number of partner neuroligins (Fig. 2A). Although neurexin-1β is primarily expressed in excitatory presynaptic terminals of hippocampal neurons, forced expression of neurexin-1β in presynaptic interneurons has been shown to induce neuroligin-1 to act towards inhibitory synapses, rather than excitatory synapses (Futai et al., 2013). Neuroligin-2 and neuroligin-3 also function to specify specific synaptic properties depending on the identity of presynaptic partners (Foldy et al., 2013; Gibson et al., 2009). Collectively, these reports suggest the tantalizing hypothesis that neurexins and neuroligins differentially control the connectivity and activity of specific neural circuits to orchestrate distinct signaling pathways in a context-dependent manner. During postnatal development of the cerebellar cortex, Purkinje cells act as the principal output neurons and feature a regular and highly stereotyped pattern of glutamatergic and GABAergic synaptic connections, such that certain presynaptic neurons preferentially synapse onto the Purkinje cell body and axon initial segment, whereas others selectively target distinct dendritic domains (Sassoe-Pognetto and Patrizi, 2017) (Fig. 2B). 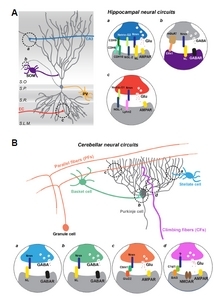 The neural circuitry involving Purkinje cells has been used as an experimental model system for investigating molecular and cellular mechanisms underlying synaptic specificity (reviewed (Cerminara et al., 2015; Kano and Hashimoto, 2009; Mapelli et al., 2015; Uesaka et al., 2015)). In this minireview, we focus on two major glutamatergic circuits: parallel fiber (PF) circuits originating in deep granule neurons, and climbing fiber (CF) circuits originating from inferior olive neurons. The formation and maintenance of both PF and CF synapses depend on distinct sets of molecular players acting through distinct signaling pathways, particularly cell-surface proteins (see below). Purkinje cells also receive GABAergic inputs from molecular layer interneurons (stellate cells and basket cells), and form inhibitory circuits together with Golgi cells (Hull and Regehr, 2012). Neurofascin 186 and related immunoglobulin domain-containing cell surface proteins are involved in inhibitory synapse formation at distinct subcellular compartments of Purkinje cells. Because of space constraints, inhibitory circuits of the cerebellum are not discussed further in the current review. CFs form synapses on thorny spines located on the proximal dendritic domain. Purkinje cells are initially innervated by multiple CFs that make synapses on the cell body, but only a single CF translocates from the cell body to the proximal dendrites and, starting at postnatal day 9, the remaining perisomatic contacts are eliminated, through a defined sequence of molecular events (Watanabe and Kano, 2011) (Fig. 2B). Not surprisingly, structural defects during early stages of circuit development caused by abnormal Purkinje cell activity lead to multi-innervation or mis-patterning of CFs, resulting in movement disorders, such as ataxia (Miterko and Sillitoe, 2017). Thus, elimination of early-formed, redundant synapses is crucial for functional neural circuit development in the cerebellum. Activity-dependent cerebellar synapse elimination depends on functional NMDA-type glutamate receptors (Kakizawa et al., 2000), and on functional GA-BAergic inhibition (Nakayama et al., 2012) in specified developmental time window (postnatal days 15–16 for NMDA receptors and postnatal days 10–16 for GABA receptors). A recent study demonstrated that brain-derived neurotrophic factor (BDNF) secreted by Purkinje cells promotes CF synapse elimination from somata through retrograde BDNF-TrkB and mGluR1 signaling pathways (Choo et al., 2017). However, the molecular features governing how CF synapses are formed, specified, and eliminated have remained largely elusive. C1ql1, a member of the C1q protein superfamily, is expressed in inferior olivary neurons, secreted by CFs (Iijima et al., 2010), and directly interacts with cell-adhesion G protein-coupled BAI3 (receptor brain-specific angiogenesis inhibitor 3), which is strongly expressed on postsynaptic Purkinje cells (Bolliger et al., 2011; Kakegawa et al., 2015). Strikingly, the C1ql1/BAI3 complex is crucial for regulating the formation and maintenance of a ‘single-winner’ CF during mouse cerebellar development and adulthood (Kakegawa et al., 2015; Sigoillot et al., 2015). Moreover, C1ql1/BAI3 signaling is required for motor learning, but not for gross motor performance or coordination (Kakegawa et al., 2015). However, it remains to be determined how the C1ql1/BAI3 signaling pathway specifically confers the specificity of CF synapses. Given the distinct expression patterns of C1ql members and other C1q superfamily proteins (Iijima et al., 2010; Miura et al., 2006), it is likely that these molecules act as distinct synapse specifiers across various brain regions. Indeed, C1ql3 is expressed in the basolateral amygdala and is specifically required for the formation and maintenance of basolateral-medial prefrontal cortical synapses that contribute to fear memories (Martinelli et al., 2016). Neuroligins and neurexins are also important for Purkinje cell synapses in a context-dependent and isoform-dependent manner (Chen et al., 2017; Zhang et al., 2015). Conditional deletion of all three neuroligins in cerebellar Purkinje cells leads to a specific decrease in CF excitatory synapse size and excitatory postsynaptic currents without affecting PF synapse properties (Zhang et al., 2015). These phenotypes are largely replicated in neuroligin-1/neurligin-2 double-knockout mice and neuroligin-1 or neuroligin-3 single-knockout mice (Zhang et al., 2015). Moreover, deletion of all three neuroligins increases the size of GABAergic basket/stellate cell synapses, but paradoxically decreases inhibitory postsynaptic currents in Purkinje cells; notably, most of these observations are recapitulated in neuroligin-2 single-knockout mice (Zhang et al., 2015). In addition, neuroligins are essential for PV-positive stellate synapses through extrasynaptic NMDA receptor signaling (Zhang and Südhof, 2016). Neurexins are also specifically required for the formation and function of CF synapses (Chen et al., 2017). These studies suggest that neuroligins and neurexins function as synapse organizers to determine the properties of specific cerebellar synapse types. PFs form a large number of synapses in the distal dendritic domain of Purkinje cells (Napper and Harvey, 1988) (Fig. 2B). The KV3 type of voltage-dependent potassium channel regulates synaptic transmission dynamics at PF synapses and motor performance (Matsukawa et al., 2003). Cerebellin 1 precursor protein (Cbln1), another member of the C1q protein superfamily, is specifically required for formation and maintenance of PF synapses, together with the δ2 glutamate receptor (GluD2) (reviewed in (Emi et al., 2013; Mishina et al., 2012). Although GluD1 is also expressed in molecular layer interneurons of the cerebellum and is concentrated at PF synapses on interneuron somata (Konno et al., 2014), the functional significance of the link between Cblns and GluD1 at the cerebellum has been largely uninvestigated. Cbln1 is released from cerebellar granule cells and forms complexes with GluD2 and specific splice variants of neurexins (Matsuda and Yuzaki, 2011; Uemura et al., 2010). These complexes play an instrumental role in mediating specific synaptic adhesion and dynamic axonal anatomical changes at PF synapses (Ito-Ishida et al., 2012; 2014). These complexes are also important for both motor and non-motor functions in multiple regions of the mouse brain (Emi et al., 2013; Otsuka et al., 2016). Collectively, these studies have started to paint a picture of the synaptic pathways that encompass the specificity of PF synapses in the cerebellum, but more studies are warranted to understand how Purkinje cells and their stereotyped connectivity are spatially and temporally regulated by distinct sets of molecular components. The functions of various synaptic molecules have begun to be investigated in a variety of neural circuits in recent years, a development that has been accelerated by the use of conditional transgenic animals in which specific genes are manipulated in specific cell types. Hippocampal and cerebellar circuits are better established than those in other brain regions; thus, many molecular mechanisms that relate to how specific synapses are formed, maintained, refined, or eliminated have been revealed in these neural circuits. Intriguingly, neurexin-3 has been shown to act through distinct mechanisms in different brain regions (Aoto et al., 2013; 2015), whereas the roles of PSD-95 and gephyrin are largely similar across various brain regions (Choii and Ko, 2015; Kim and Sheng, 2004). Thus, it will be crucial to validate the functions of synaptic molecules in the context of various neural circuits. Future advances in molecular, cellular, and systems-level neuroscientific techniques will bring us closer to an understanding of how the properties of various synapses and neural circuits are specified, and lead to the design of more precise therapeutic strategies against synaptopathy-related brain disorders. Fig. 1. (A) Illustration of the hippocampal circuitry. The canonical projections involving entorhinal cortical neurons and various hippocampal neurons are depicted by solid arrows. Abbreviations: DG, dentate gyrus; LEC, lateral entorhinal cortex; MEC, medial entorhinal cortex; and SUB, subiculum. 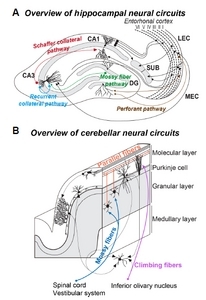 (B) Illustration of the cerebellar circuitry. The canonical projections involving various cerebellar neurons are depicted by solid arrows. Abbreviations: CF, climbing fiber; and PF, parallel fiber. Fig. 2. (A) Simplified neural circuit schematic showing projections from the entorhinal cortex (EC) to the hippocampal CA1 subfield (red), from the hippocampal CA3 subfield to the CA1 subfield (blue), from the hippocampal CA1 pyramidal neuron to somatostatin-positive inhibitory neuron (purple). A subset of the indicated cell-surface proteins confers the synaptic specificity between hippocampal CA1 pyramidal neurons and other brain area neurons; (a) connections of the CA3 with distal dendrites of hippocampal CA1 in the SO layer; (b) connections of somatostatin (SOM)-positive interneurons with hippocampal CA1 in the SO layer; and (c) connections of the EC with hippocampal CA1 in the SLM layer. Abbreviations: AMPAR, α-amino-3-hydroxy-5-methyl-4-isoxazolepropionic acid receptor; CDH, cadherin: EC, entorhinal cortex; Elfn, extracellular leucine-rich repeat and fibronectin type III domain containing; Lphn, latrophilin; mGluR, metabotropic glutamate receptor; NGL, netrin G-ligand; NL, neuroligin; Nrxn, neurexin; S.L.M., stratum lacunosum moleculare; S.O., stratum oriens; SOM, somatostatin; S.R., stratum radiatum; and PV, parvalbumin. (B) Simplified schematic highlighting the diversity of molecular players that confer synaptic specificity in cerebellar neural circuits. Abbreviations: AMPAR, α-amino-3-hydroxy-5-methyl-4-isoxazolepropionic acid receptor; BC, basket cell; BAI, brain-specific angiogenesis inhibitor; Cbln, cerebellin precursor; C1ql, complement component 1 (q subcomponent-like); CF, climbing fiber; GABA, γ-aminobutyric acid; GABAR, GABA-type ionotropic receptor; GC, granule cell; Glu, glutamate; GluD, glutamate receptor δ family; MF, mossy fiber; NMDAR, N-methyl-D-aspartate receptor; Nrxn, neurexin; NL, neuroligin; PC, purkinje cell; PF, parallel fiber; and SC, stellate cell. Allen, N.J., and Eroglu, C. (2017). Cell biology of astrocyte-synapse interactions. Neuron. 96, 697-708. Anderson, G.R., Aoto, J., Tabuchi, K., Foldy, C., Covy, J., Yee, A.X., Wu, D., Lee, S.J., Chen, L., and Malenka, R.C. (2015). beta-neurexins control neural circuits by regulating synaptic endocannabinoid signaling. Cell. 162, 593-606. Anderson, G.R., Maxeiner, S., Sando, R., Tsetsenis, T., Malenka, R.C., and Südhof, T.C. (2017). Postsynaptic adhesion GPCR latrophilin-2 mediates target recognition in entorhinal-hippocampal synapse assembly. J Cell Biol. 216, 3831-3846. Aoto, J., Martinelli, D.C., Malenka, R.C., Tabuchi, K., and Südhof, T.C. (2013). Presynaptic neurexin-3 alternative splicing trans-synaptically controls postsynaptic AMPA receptor trafficking. Cell. 154, 75-88. Aoto, J., Foldy, C., Ilcus, S.M., Tabuchi, K., and Südhof, T.C. (2015). Distinct circuit-dependent functions of presynaptic neurexin-3 at GABAergic and glutamatergic synapses. Nat Neurosci. 18, 997-1007. Basu, J., Zaremba, J.D., Cheung, S.K., Hitti, F.L., Zemelman, B.V., Losonczy, A., and Siegelbaum, S.A. (2016). Gating of hippocampal activity, plasticity, and memory by entorhinal cortex long-range inhibition. Science. 351, aaa5694. Basu, R., Duan, X., Taylor, M.R., Martin, E.A., Muralidhar, S., Wang, Y., Gangi-Wellman, L., Das, S.C., Yamagata, M., and West, P.J. (2017). Heterophilic type II cadherins are required for high-magnitude synaptic potentiation in the hippocampus. Neuron. 96, 160-176 e168. Bemben, M.A., Shipman, S.L., Nicoll, R.A., and Roche, K.W. (2015). The cellular and molecular landscape of neuroligins. Trends Neurosci. 38, 496-505. Bolliger, M.F., Martinelli, D.C., and Südhof, T.C. (2011). The cell-adhesion G protein-coupled receptor BAI3 is a high-affinity receptor for C1q-like proteins. Proc Natl Acad Sci USA. 108, 2534-2539. Boucard, A.A., Ko, J., and Südhof, T.C. (2012). High affinity neurexin binding to cell adhesion G-protein-coupled receptor CIRL1/latrophilin-1 produces an intercellular adhesion complex. J Biol Chem. 287, 9399-9413. Cerminara, N.L., Lang, E.J., Sillitoe, R.V., and Apps, R. (2015). Redefining the cerebellar cortex as an assembly of non-uniform Purkinje cell microcircuits. Nat Rev Neurosci. 16, 79-93. Chen, L.Y., Jiang, M., Zhang, B., Gokce, O., and Südhof, T.C. (2017). Conditional deletion of all neurexins defines diversity of essential synaptic organizer functions for neurexins. Neuron. 94, 611-625 e614. Choi, S.Y., Han, K., Cutforth, T., Chung, W., Park, H., Lee, D., Kim, R., Kim, M.H., Choi, Y., and Shen, K. (2015). Mice lacking the synaptic adhesion molecule Neph2/Kirrel3 display moderate hyperactivity and defective novel object preference. Front Cell Neurosci. 9, 283. Choii, G., and Ko, J. (2015). Gephyrin: a central GABAergic synapse organizer. Exp Mol Med. 47, e158. Choo, M., Miyazaki, T., Yamazaki, M., Kawamura, M., Nakazawa, T., Zhang, J., Tanimura, A., Uesaka, N., Watanabe, M., and Sakimura, K. (2017). Retrograde BDNF to TrkB signaling promotes synapse elimination in the developing cerebellum. Nat Commun. 8, 195.
de Wit, J., and Ghosh, A. (2014). Control of neural circuit formation by leucine-rich repeat proteins. Trends Neurosci. 37, 539-550.
de Wit, J., and Ghosh, A. (2016). Specification of synaptic connectivity by cell surface interactions. Nat Rev Neurosci. 17, 22-35. DeNardo, L.A., de Wit, J., Otto-Hitt, S., and Ghosh, A. (2012). NGL-2 regulates input-specific synapse development in CA1 pyramidal neurons. Neuron. 76, 762-775. Dolan, J., and Mitchell, K.J. (2013). Mutation of Elfn1 in mice causes seizures and hyperactivity. PLoS One. 8, e80491. Eichenbaum, H., Yonelinas, A.P., and Ranganath, C. (2007). The medial temporal lobe and recognition memory. Annu Rev Neurosci. 30, 123-152. Emi, K., Kakegawa, W., Miura, E., Ito-Ishida, A., Kohda, K., and Yuzaki, M. (2013). Reevaluation of the role of parallel fiber synapses in delay eyeblink conditioning in mice using Cbln1 as a tool. Front Neural Circuits. 7, 180. Foldy, C., Malenka, R.C., and Südhof, T.C. (2013). Autism-associated neuroligin-3 mutations commonly disrupt tonic endocannabinoid signaling. Neuron. 78, 498-509. Foldy, C., Darmanis, S., Aoto, J., Malenka, R.C., Quake, S.R., and Südhof, T.C. (2016). Single-cell RNAseq reveals cell adhesion molecule profiles in electrophysiologically defined neurons. Proc Natl Acad Sci USA. 113, E5222-5231. Futai, K., Doty, C.D., Baek, B., Ryu, J., and Sheng, M. (2013). Specific trans-synaptic interaction with inhibitory interneuronal neurexin underlies differential ability of neuroligins to induce functional inhibitory synapses. J Neurosci. 33, 3612-3623. Gandal, M.J., Leppa, V., Won, H., Parikshak, N.N., and Geschwind, D.H. (2016). The road to precision psychiatry: translating genetics into disease mechanisms. Nat Neurosci. 19, 1397-1407. Gibson, J.R., Huber, K.M., and Südhof, T.C. (2009). Neuroligin-2 deletion selectively decreases inhibitory synaptic transmission originating from fast-spiking but not from somatostatin-positive interneurons. J Neurosci. 29, 13883-13897. Huganir, R.L., and Nicoll, R.A. (2013). AMPARs and synaptic plasticity: the last 25 years. Neuron. 80, 704-717. Hull, C., and Regehr, W.G. (2012). Identification of an inhibitory circuit that regulates cerebellar Golgi cell activity. Neuron. 73, 149-158. Iijima, T., Miura, E., Watanabe, M., and Yuzaki, M. (2010). Distinct expression of C1q-like family mRNAs in mouse brain and biochemical characterization of their encoded proteins. Eur J Neurosci. 31, 1606-1615. Ito-Ishida, A., Miyazaki, T., Miura, E., Matsuda, K., Watanabe, M., Yuzaki, M., and Okabe, S. (2012). Presynaptically released Cbln1 induces dynamic axonal structural changes by interacting with GluD2 during cerebellar synapse formation. Neuron. 76, 549-564. Ito-Ishida, A., Okabe, S., and Yuzaki, M. (2014). The role of Cbln1 on Purkinje cell synapse formation. Neurosci Res. 83, 64-68. Kakegawa, W., Mitakidis, N., Miura, E., Abe, M., Matsuda, K., Takeo, Y.H., Kohda, K., Motohashi, J., Takahashi, A., and Nagao, S. (2015). Anterograde C1ql1 signaling is required in order to determine and maintain a single-winner climbing fiber in the mouse cerebellum. Neuron. 85, 316-329. Kakizawa, S., Yamasaki, M., Watanabe, M., and Kano, M. (2000). Critical period for activity-dependent synapse elimination in developing cerebellum. J Neurosci. 20, 4954-4961. Kano, M., and Hashimoto, K. (2009). Synapse elimination in the central nervous system. Curr Opin Neurobiol. 19, 154-161. Katzman, A., and Alberini, C.M. (2017). NLGN1 and NLGN2 in the prefrontal cortex: their role in memory consolidation and strengthening. Curr Opin Neurobiol. 48, 122-130. Kim, E., and Sheng, M. (2004). PDZ domain proteins of synapses. Nat Rev Neurosci. 5, 771-781. Kim, J.A., Kim, D., Won, S.Y., Han, K.A., Park, D., Cho, E., Yun, N., An, H.J., Um, J.W., and Kim, E. (2017). Structural insights into modulation of neurexin-neuroligin trans-synaptic adhesion by MDGA1/neuroligin-2 complex. Neuron. 94, 1121-1131 e1126. Kitamura, T., Macdonald, C.J., and Tonegawa, S. (2015a). Entorhinal-hippocampal neuronal circuits bridge temporally discontiguous events. Learn Mem. 22, 438-443. Kitamura, T., Sun, C., Martin, J., Kitch, L.J., Schnitzer, M.J., and Tonegawa, S. (2015b). Entorhinal cortical ocean cells encode specific contexts and drive context-specific fear memory. Neuron. 87, 1317-1331. Konno, K., Matsuda, K., Nakamoto, C., Uchigashima, M., Miyazaki, T., Yamasaki, M., Sakimura, K., Yuzaki, M., and Watanabe, M. (2014). Enriched expression of GluD1 in higher brain regions and its involvement in parallel fiber-interneuron synapse formation in the cerebellum. J Neurosci. 34, 7412-7424. Li, Y., Xu, J., Liu, Y., Zhu, J., Liu, N., Zeng, W., Huang, N., Rasch, M.J., Jiang, H., and Gu, X. (2017). A distinct entorhinal cortex to hippocampal CA1 direct circuit for olfactory associative learning. Nat Neurosci. 20, 559-570. Lu, Y.C., Nazarko, O.V., Sando, R., Salzman, G.S., Südhof, T.C., and Arac, D. (2015). Structural Basis of Latrophilin-FLRT-UNC5 Interaction in Cell Adhesion. Structure. 23, 1678-1691. Mapelli, L., Pagani, M., Garrido, J.A., and D’Angelo, E. (2015). Integrated plasticity at inhibitory and excitatory synapses in the cerebellar circuit. Front Cell Neurosci. 9, 169. Martin, E.A., Muralidhar, S., Wang, Z., Cervantes, D.C., Basu, R., Taylor, M.R., Hunter, J., Cutforth, T., Wilke, S.A., and Ghosh, A. (2015). The intellectual disability gene Kirrel3 regulates target-specific mossy fiber synapse development in the hippocampus. Elife. 4, e09395. Martin, E.A., Woodruff, D., Rawson, R.L., and Williams, M.E. (2017). Examining hippocampal mossy fiber synapses by 3D electron microscopy in wildtype and Kirrel3 knockout mice. eNeuro. 4. Martinelli, D.C., Chew, K.S., Rohlmann, A., Lum, M.Y., Ressl, S., Hattar, S., Brunger, A.T., Missler, M., and Südhof, T.C. (2016). Expression of C1ql3 in discrete neuronal populations controls efferent synapse numbers and diverse behaviors. Neuron. 91, 1034-1051. Matsuda, K., and Yuzaki, M. (2011). Cbln family proteins promote synapse formation by regulating distinct neurexin signaling pathways in various brain regions. Eur J Neurosci. 33, 1447-1461. Matsukawa, H., Wolf, A.M., Matsushita, S., Joho, R.H., and Knopfel, T. (2003). Motor dysfunction and altered synaptic transmission at the parallel fiber-Purkinje cell synapse in mice lacking potassium channels Kv3.1 and Kv3.3. J Neurosci. 23, 7677-7684. McBain, C.J., and Fisahn, A. (2001). Interneurons unbound. Nat Rev Neurosci. 2, 11-23. Megias, M., Emri, Z., Freund, T.F., and Gulyas, A.I. (2001). Total number and distribution of inhibitory and excitatory synapses on hippocampal CA1 pyramidal cells. Neuroscience. 102, 527-540. Mishina, M., Uemura, T., Yasumura, M., and Yoshida, T. (2012). Molecular mechanism of parallel fiber-Purkinje cell synapse formation. Front Neural Circuits. 6, 90. Miterko, L.N., and Sillitoe, R.V. (2017). Climbing Fiber Development Is Impaired in Postnatal Car8 (wdl). Mice Cerebellum. Miura, E., Iijima, T., Yuzaki, M., and Watanabe, M. (2006). Distinct expression of Cbln family mRNAs in developing and adult mouse brains. Eur J Neurosci. 24, 750-760. Nakayama, H., Miyazaki, T., Kitamura, K., Hashimoto, K., Yanagawa, Y., Obata, K., Sakimura, K., Watanabe, M., and Kano, M. (2012). GABAergic inhibition regulates developmental synapse elimination in the cerebellum. Neuron. 74, 384-396. Napper, R.M., and Harvey, R.J. (1988). Number of parallel fiber synapses on an individual Purkinje cell in the cerebellum of the rat. J Comp Neurol. 274, 168-177. Nguyen, Q.A., Horn, M.E., and Nicoll, R.A. (2016). Distinct roles for extracellular and intracellular domains in neuroligin function at inhibitory synapses. Elife, 5. Nishimura-Akiyoshi, S., Niimi, K., Nakashiba, T., and Itohara, S. (2007). Axonal netrin-Gs transneuronally determine lamina-specific subdendritic segments. Proc Natl Acad Sci U S A. 104, 14801-14806. O’Sullivan, M.L., de Wit, J., Savas, J.N., Comoletti, D., Otto-Hitt, S., Yates, J.R., and Ghosh, A. (2012). FLRT proteins are endogenous latrophilin ligands and regulate excitatory synapse development. Neuron. 73, 903-910. Otsuka, S., Konno, K., Abe, M., Motohashi, J., Kohda, K., Sakimura, K., Watanabe, M., and Yuzaki, M. (2016). Roles of Cbln1 in non-motor functions of mice. J Neurosci. 36, 11801-11816. Paul, A., Crow, M., Raudales, R., He, M., Gillis, J., and Huang, Z.J. (2017). Transcriptional architecture of synaptic communication delineates GABAergic neuron identity. Cell. 171, 522-539 e520. Roh, J.D., Choi, S.Y., Cho, Y.S., Choi, T.Y., Park, J.S., Cutforth, T., Chung, W., Park, H., Lee, D., and Kim, M.H. (2017). Increased excitatory synaptic transmission of dentate granule neurons in mice lacking PSD-95-interacting adhesion molecule Neph2/Kirrel3 during the early postnatal eriod. Front Mol Neurosci. 10, 81. Ruediger, S., Vittori, C., Bednarek, E., Genoud, C., Strata, P., Sacchetti, B., and Caroni, P. (2011). Learning-related feedforward inhibitory connectivity growth required for memory precision. Nature. 473, 514-518. Sasaki, T., Leutgeb, S., and Leutgeb, J.K. (2015). Spatial and memory circuits in the medial entorhinal cortex. Curr Opin Neurobiol. 32, 16-23. Sassoe-Pognetto, M., and Patrizi, A. (2017). The Purkinje cell as a model of synaptogenesis and synaptic specificity. Brain Res Bull. 129, 12-17. Shekhar, K., Lapan, S.W., Whitney, I.E., Tran, N.M., Macosko, E.Z., Kowalczyk, M., Adiconis, X., Levin, J.Z., Nemesh, J., and Goldman, M. (2016). Comprehensive classification of retinal bipolar neurons by single-cell transcriptomics. Cell. 166, 1308-1323 e1330. Shen, K., and Scheiffele, P. (2010). Genetics and cell biology of building specific synaptic connectivity. Annu Rev Neurosci. 33, 473-507. Sigoillot, S.M., Iyer, K., Binda, F., Gonzalez-Calvo, I., Talleur, M., Vodjdani, G., Isope, P., and Selimi, F. (2015). The secreted protein C1QL1 and its receptor BAI3 control the synaptic connectivity of excitatory inputs converging on cerebellar purkinje cells. Cell Rep.
Silva, J.P., Lelianova, V.G., Ermolyuk, Y.S., Vysokov, N., Hitchen, P.G., Berninghausen, O., Rahman, M.A., Zangrandi, A., Fidalgo, S., and Tonevitsky, A.G. (2011). Latrophilin 1 and its endogenous ligand Lasso/teneurin-2 form a high-affinity transsynaptic receptor pair with signaling capabilities. Proc Natl Acad Sci USA. 108, 12113-12118. Spruston, N. (2008). Pyramidal neurons: dendritic structure and synaptic integration. Nat Rev Neurosci. 9, 206-221. Südhof, T.C. (2017a). Molecular neuroscience in the 21st century: a personal perspective. Neuron. 96, 536-541. Südhof, T.C. (2017b). Synaptic neurexin complexes: A molecular code for the logic of neural circuits. Cell. 171, 745-769. Suh, J., Rivest, A.J., Nakashiba, T., Tominaga, T., and Tonegawa, S. (2011). Entorhinal cortex layer III input to the hippocampus is crucial for temporal association memory. Science. 334, 1415-1420. Sylwestrak, E.L., and Ghosh, A. (2012). Elfn1 regulates target-specific release probability at CA1-interneuron synapses. Science. 338, 536-540. Tomioka, N.H., Yasuda, H., Miyamoto, H., Hatayama, M., Morimura, N., Matsumoto, Y., Suzuki, T., Odagawa, M., Odaka, Y.S., and Iwayama, Y. (2014). Elfn1 recruits presynaptic mGluR7 in trans and its loss results in seizures. Nat Commun. 5, 4501. Torborg, C.L., Nakashiba, T., Tonegawa, S., and McBain, C.J. (2010). Control of CA3 output by feedforward inhibition despite developmental changes in the excitation-inhibition balance. J Neurosci. 30, 15628-15637. Uemura, T., Lee, S.J., Yasumura, M., Takeuchi, T., Yoshida, T., Ra, M., Taguchi, R., Sakimura, K., and Mishina, M. (2010). Trans-synaptic interaction of GluRdelta2 and Neurexin through Cbln1 mediates synapse formation in the cerebellum. Cell. 141, 1068-1079. Uesaka, N., Uchigashima, M., Mikuni, T., Hirai, H., Watanabe, M., and Kano, M. (2015). Retrograde signaling for climbing fiber synapse elimination. Cerebellum. 14, 4-7. Um, J.W., and Ko, J. (2017). Neural Glycosylphosphatidylinositol-Anchored Proteins in Synaptic Specification. Trends Cell Biol. 27, 931-945. Watanabe, M., and Kano, M. (2011). Climbing fiber synapse elimination in cerebellar Purkinje cells. Eur J Neurosci. 34, 1697-1710. Williams, M.E., de Wit, J., and Ghosh, A. (2010). Molecular mechanisms of synaptic specificity in developing neural circuits. Neuron. 68, 9-18. Williams, M.E., Wilke, S.A., Daggett, A., Davis, E., Otto, S., Ravi, D., Ripley, B., Bushong, E.A., Ellisman, M.H., and Klein, G. (2011). Cadherin-9 regulates synapse-specific differentiation in the developing hippocampus. Neuron. 71, 640-655. Witter, M.P., Naber, P.A., van Haeften, T., Machielsen, W.C., Rombouts, S.A., Barkhof, F., Scheltens, P., and Lopes da Silva, F.H. (2000a). Cortico-hippocampal communication by way of parallel parahippocampal-subicular pathways. Hippocampus. 10, 398-410. Witter, M.P., Wouterlood, F.G., Naber, P.A., and Van Haeften, T. (2000b). Anatomical organization of the parahippocampal-hippocampal network. Ann N Y Acad Sci. 911, 1-24. Zhang, B., and Südhof, T.C. (2016). Neuroligins are selectively essential for NMDAR signaling in cerebellar stellate interneurons. J Neurosci. 36, 9070-9083. Zhang, B., Chen, L.Y., Liu, X., Maxeiner, S., Lee, S.J., Gokce, O., and Südhof, T.C. (2015). Neuroligins sculpt cerebellar purkinje-cell circuits by differential control of distinct classes of synapses. Neuron. 87, 781-796.